This entry was posted in Actors, Character portrait, Reviews, War Movie, WWI and tagged All Quiet on the Western Front, Battle of Loos, Daniel Radcliffe, David Haig, Kim Cattrall, Movies, My Boy Jack, Reviews, War Movies, WWI. Hello, I’m Manu and I live in Ghent, Belgium. I’m interested in history, also very much in military history. 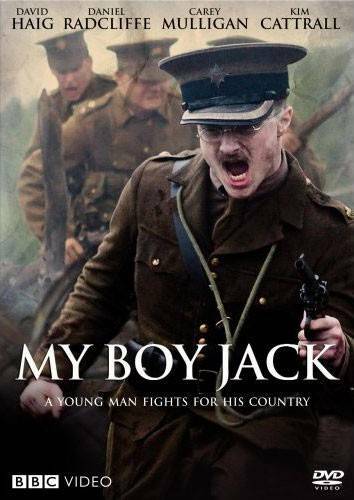 Quite by accident, I just happened to watch “My Boy Jack” as it was broadcasted here on Flemish television an hour ago. You’re definitely right, this movie really makes sense and I was really moved by it. Heartbreaking and good actors. I know who Kipling is, off course, and many Flemmings do but this story is pretty unknown out here in although we live nearby the famous “Flanders’ Fields”! Nice site you’ve got and keep it up, I’d say! Hi Manu, thanks for visiting and for your comment. Maybe I was a bit harsh regarding Radcliffe. I still remember almost every detail of this movie. It is very good. I always had a particular interest in WWI. Did you ever watch Regeneration? Very good. I reviewed it a while back. I have read some of Kiplings books but did not know what happened to his son either. It’s hard to imagine how he must have felt when he lost him. I have been in Brugge/Bruges and Bruxelles but would like to visit some of the former battlefields and cemetaries. Do you know of any Belgian movies on WWI? Would be interesting. Thanks for your coment. I have a feeling that if I watched it again I would be far less critical of him. I just saw him in The Woman in Black and thought he did a fine job. When I watched My Boy jack, I had Harry Potter in mind and that did interfere with my watching.